The Antarctic Peninsula is warming at rates much greater than the rest of the planet, leading to large losses of sea ice, prime habitat for minke whales. Tiny, shrimp-like crustaceans called krill, which feed on algae and phytoplankton that grow on the underside of sea ice, serve as the main food for minkes. As melting sea ice threatens krill populations, minkes, and the ecological role they play, are also at risk. Earlier this year, a team of scientists traveled to the peninsula to study minke whales, ultimately seeking to better understand the impact of climate change in this polar region. 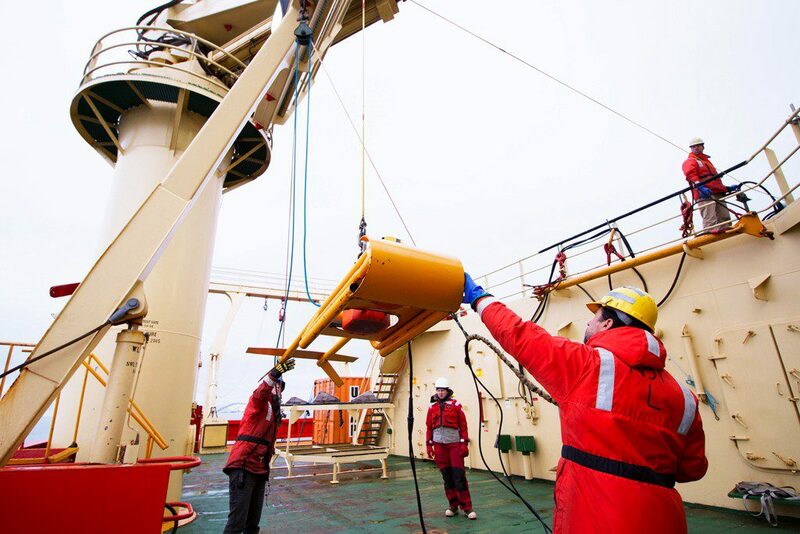 Aboard icebreaker RV Laurence M. Gould and small Zodiac boats, the researchers used a suite of new tools to measure the underwater behavior of the whales and better understand how they use sea ice. Whale video camera tagging team dwarfed by wall of ice, Antarctic Peninsula 2018. Credits: ML Parker (photo), locator map (NOAA). 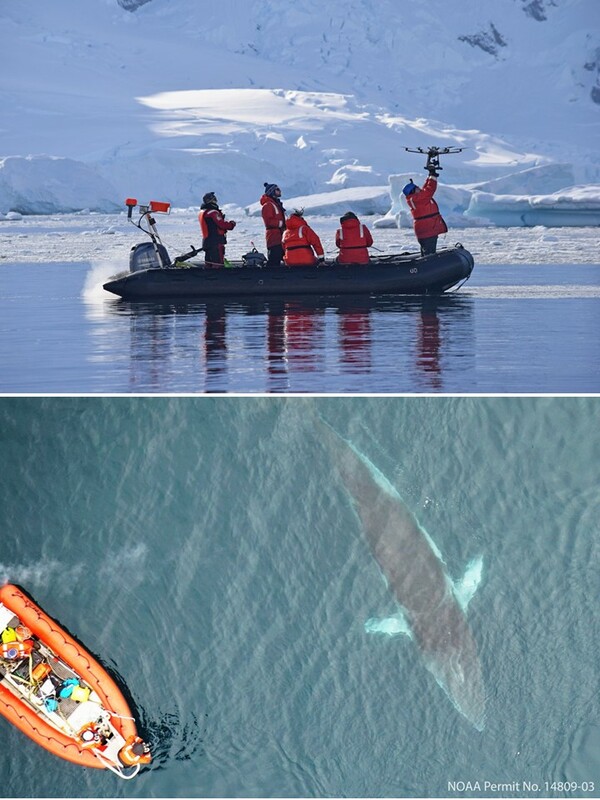 Researchers launch drone camera (top), Credit: ML Parker; Drone photo of minke whale (bottom), Credit: KC Bierlich, Duke University. 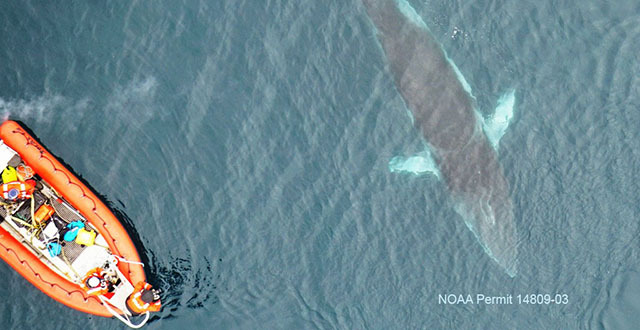 Whale-mounted, location-tracking video cameras allowed the team to determine where and when the whales fed. (The cameras have suction cups for attachment and fall off the whales after a day or two.) Drones generated real-time images of sea ice cover that were then linked with tracking data to determine how much time whales spent under sea ice versus open water and how the behavior of the whales changed between the two habitats. Finally, the scientists used echosounders to characterize the prey targeted by the whales and to look for differences in krill availability in and out of the ice. NCCOS’s Dr. Chris Taylor led the krill mapping for the team using echosounders, devices that detect objects in the water by measuring the time taken for sound echoes to return to the listener. The echosounders provided near-instant measures of the biomass of krill swarms that the whales fed on during their shallow and deep dives. The team discovered the largest swarms of krill (at times stretching over a mile long) at a depth of roughly 490 feet, which explained why the minke whales were diving deeper than the researchers expected. The project is co-led by the University of California at Santa Cruz and Duke University, and includes scientists from the National Science Foundation, Stanford University, and NCCOS. The research is authorized by NOAA Permit 14809. For more information, contact Chris.Taylor@noaa.gov. Dr. Chris Taylor (right) and crew prepare to deploy underwater echosounder mounted on tow fish. Credit: ML Parker.